When I was nine years old, I lived in a small Ohio farm town, surrounded by corn fields and cow pastures. That year - in 1979, I vividly recall walking home from my friend’s house barefoot in the cool, wet grass when I started to vision my life as an adult. Even then I felt a strong magnetic pull toward the unknown and away from my small town. I wanted to see new places, experience new things, and build a life in a new place. At that same time in 1979, exactly 2,479 miles away from my provincial existence, Greens Restaurant opened in San Francisco. Greens too was looking to be and do something different. It forged a path and became an iconic vegetarian, fine dining restaurant. The San Francisco Zen Center operates Greens Restaurant, as well as Tassajara Zen Mountain Retreat and Green Gulch Farm. Since the early 1980s Executive Chef Annie Somerville has been at the helm after leaving Chez Panisse and working for a time at Greens with founding chef Deborah Madison. In 1979 when Greens opened and into the early 1980s, according to Somerville in a 2013 interview by San Francisco Chronicle reporter Paolo Lucchesi, “it was a very different time. A really exciting time. Greens was super busy, and what were doing was very cutting edge. We were just creating something very new, just making it up. Sometimes you don’t realize you’re making it up at the time — but we were.” What Madison and Somerville created was one of the first fine dining vegetarian restaurants that would become a classic San Francisco restaurant. Last week I dined at Greens on a perfect spring day - a day that felt like anything and everything was possible. Fittingly for the first course, I selected the Grilled Zuckerman Farms Asparagus with Green Garlic Ranch, Grilled Polenta, Arugula, Red Endive, and Grana Padana cheese ($15), paired with a crisp half glass of Chenin Blanc - the 2015 Vincent Raimbault Vouvray-Sec from the Loire Valley, France ($5.50). The menu listed several wines by the glass - each one also available by the half glass, something I wish more restaurants would do. The option of half glasses enables diners to sample a wider variety of wines without becoming too tipsy or racking up the alcohol tab. 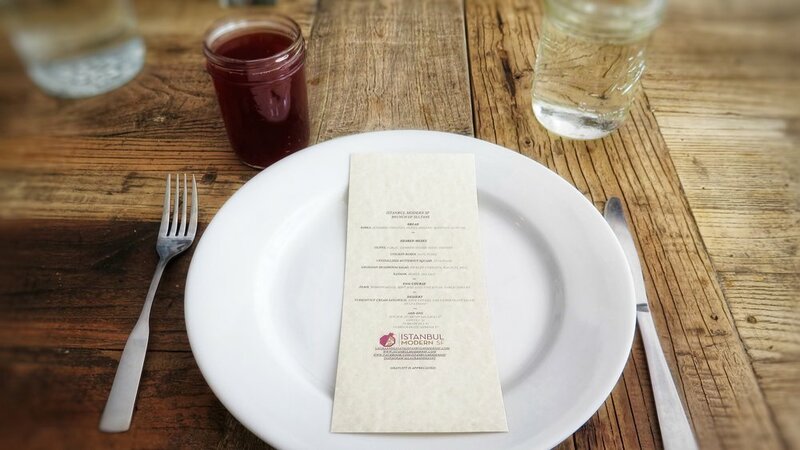 For my entree I chose wisely: the Wild Mushroom & Grilled Cheese Sandwich served with a salad of escarole, fries, arugula, beets, fennel, pine Nate and a Meyer lemon vinaigrette ($17.50) paired with a 2015 Jigsaw Pinot Noir from the Willamette Valley in Oregon ($14). The earthy, plump mushrooms were accented with bright flavors from the carmelized onions, Italian parsley and thyme on perfectly grilled, melt-in-your mouth Acme Pan de Mie bread. Astonishily it was hearty yet delicate. In contrast to my uber-rich cheese-dominated homemade grilled cheese sandwich, this one had just enough cheese to envelope the mushrooms and add a subtle richness. It was simply divine. 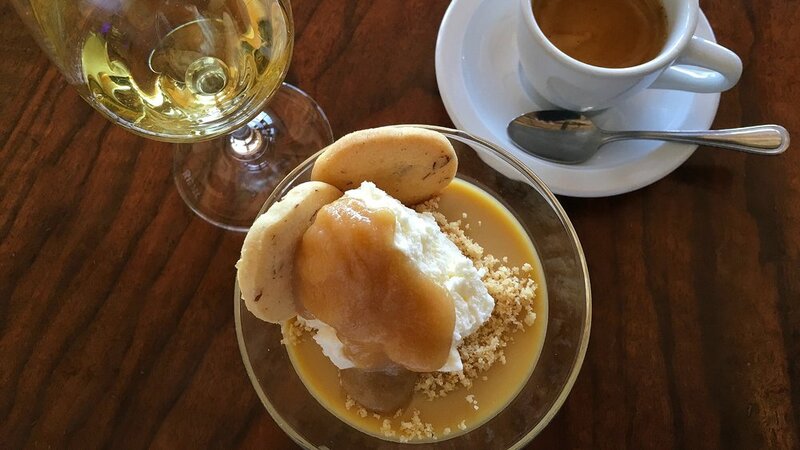 For dessert I selected the Butterscotch Pot de Creme topped with Whipped Cream, Toffee Sauce and Pecan Shortbread cookies ($9.75) and paired it with a half glass of the suggested 2014 Chateau Roumieu-Lacoste Sauternes ($6.50). Creamy, crunchy and cool, it was a decadent end to a delicious meal. It makes me happy to know that Greens is still going strong after nearly 40 years and continuing to pack in the crowds. Greens is among the quintessential San Francisco restaurants to which locals and visitors alike will return year after year. Sayat Ozyilmaz was looking for love. A labor of love, that is. When he ditched his career in business analytics and operations to enroll in cooking school in 2013, he found a career he loved and a fellow student who became his partner in life and business, Laura Millan. Together they now own Istanbul Modern SF, preparing foods of Sayat's Istanbul origin with Turkish, Greek, Armenian, Jewish, Arabic and Persian influences. Istanbul Modern presently hosts pop-ups in San Francisco through Feastly, but Sayat and Laura are soon to be owners of a brick and mortar restaurant in Pacific Heights. At the Sultan's Brunch on Saturday, they announced they had just inked the deal and hope to open their doors before the end of 2018. And so the Culinary Institute of America provided fertile ground for Sayat's passionate explorations in and outside of the kitchen. By exploring his past and the roots that formed his experience, Sayat forged the path to his future. Sayat's story inspired me, since I recently decided to change careers and take some time to explore my passion -- nay, my obsession, with food and wine. My journey begins in earnest after a few months of winding down my current position. But until then, I plan to let my curiosity lead me and connect with people, like Sayat and Laura, who are doing interesting things in food. This is their story, told though an eight course Sultan’s Brunch - a bargain at $35 for the base menu. We toasted the opening act of the Brunch of Sultans with a Pomegranate Mimosa (a $7 add on). 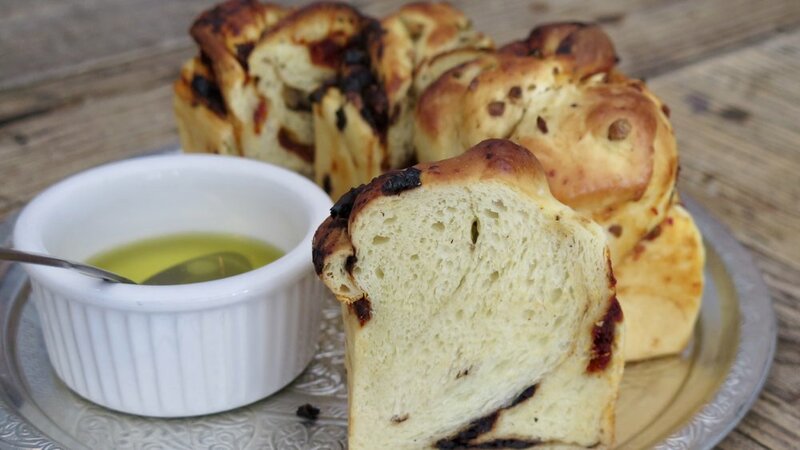 After all guests were seated, the tasting menu commenced with a savory Babka flecked with sundried tomatoes, olives, and an organic Skipstone Olive Oil. Served warm and sliced in thick slabs, the babka beckoned to be drizzled with the rich, buttery olive oil. Next up came a five dishes of Shared Mezes - a dizzying display of culinary acumen. First came Olives doused in a delicious blend of garlic, candied sesame seeds, and peppers with nigella and sesame seeds. Served in an ornate dish Sayat and Laura procured in Istanbul, the olives were spicy and sultry. Then came a Georgian Mushroom Salad with pickled currants, walnuts, and dill on a bed of nutty farro and topped with foraged edible sorrel blossoms. This was one of our favorite dishes. It reflected the promise of spring on a winter day with earthy ingredients. Sayat pickled the currants in champagne vinegar - a trick I’ll surely replicate back home in our kitchen to add a bright punch to any slow cooked, savory dish or even a quickly prepared couscous with preserved lemons (I’m making some today thanks to our neighbor’s fertile Meyer lemon tree). I loved this dish and the balance it struck with the sweet Cyrstallized Butternut Squash served in a pool of tart feta foam. Since Laura received a certificate in molecular gastronomy, I sensed her strong influence on that delectable dish. The meze course also included a Chicken Borek with Date Purée - crispy little phyllo dough love wands rolled around ground chicken and spices with that sweet and sticky date dollop. Yum. And speaking of yum, the final meze dish was Kaymak served with honey and flecked with sea salt. This was my first inttroduction to Kaymak, described by some as a dairy product similar to clotted cream. Sayat and Laura’s version was made from both buffalo and cow’s milk. To me it was like the creamiest, richest honey butter I’ve ever tasted. We slathered it on pieces of warm pita and devoured it lustfully. Then . . . the piece de resistance: Jilbir - a rich, softly spiced tomato sauce with stewed chickpeas and garlic yogurt topped with a perfectly prepared soft-boiled egg. It was rich, savory, and satisfying, topped with crunchy garlic breadcrumbs and refreshing pieces of locally foraged Miners’ Lettuce. We also orderd a delicious side of Soujuk - a dry, spicy Turkish sausage (a $7 add on). To end the meal, we devoured these darling little Turkish Ice Cream Sandwiches composed of a layer of sour cherry ice cream between crispy wafers lined with helva foam (basically delectable marshmallow fluff) and dipped in a sultry Urfa chocolate sauce. This dessert literally hit my sweet spot, since it had it all: creamy, crunchy, sweet, and tart - all balanced against a rich chocolate sauce mildly spiced with Urfa chilis. To fully sample the Sultan’s Brunch offerings as we discovered this delicious cuisine, we also had the Sahlep (a $5 add on) - a warm, milky drink served like a latte but made from orchid root, and Melengic (a $4 add on) - a wild pistachio liquid served like an espresso with a heavy Turkish coffee resemblance despite the absence of any coffee ingredient. The Brunch of Saltans was a wonderful introduction to Instanbul Modern. It left me so satisfied that I didn’t even need to eat dinner (a rare occasion for me). But it did leave me wanting more: more understanding and appreciation of the food and people of the Middle East and more occasions to dine with Sayat and Laura. You can book a meal with Istanbul Modern SF on the Feastly website here. Read more about Istanbul Modern on Sayat and Laura’s own site: www.istanbulmodernsf.com.